Promoters have blamed bad weather for the decision to cancel a concert by Green Day in Glasgow, only hours before it was due to begin. The American band had been set to perform in Bellahouston Park on Tuesday. However, promoters PCL said the show had been cancelled because “adverse weather conditions” meant it was “no longer safe” for the bands to perform. 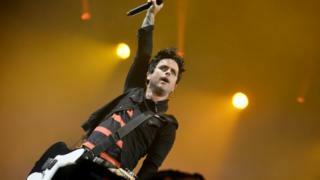 In a statement on their website Green Day said they were “very distraught”. They said the stage was deemed “unsafe for the fans and everyone involved”. The band added: “We are very distraught about this as we are in Glasgow now and were very much looking forward to this show as one the highlights of our tour. “We have been playing in extreme weather conditions throughout this European tour, and the last thing we want to do is see a show cancelled. “We love our Scottish fans and we don’t care if it’s raining… sideways, although the safety of our fans and our crew is always our top priority. Disappointed fans have been voiced their anger in light of the last-minute announcement. Charlotte Durcan, from Lincolnshire, said she and her family had travelled nearly four hours to attend the concert. “We arrived safely, paid for parking, paid for our hotel, and at 13:45 received an e-mail to say that the concert has been cancelled,” she said. “We could have saved our money,” she added. “The hotel won’t reimburse us as there is a 72-hour notice period. We will be staying there for one night only as we just came for the concert. We’re not really sure how to pass the time now. Many ticket holders took to social media to express their disappointment. One said she was “absolutely devastated” by the decision, after waiting seven years to see the band perform in Scotland. Others raised questions over the weather conditions, claiming that T in the Park and Glastonbury often go ahead in heavy rain. It also led to queries about how well prepared the organisers were for the sell-out concert. Glasgow City Council, which operates Bellahouston Park, said they did not tell the promoters to cancel the gig. They said the decision was taken by the promoters themselves, who informed the council of the move. The promoters announced the cancellation on Twitter shortly before 13:30. The gates were due to open at 14:00. They said fans would receive refunds. Police Scotland said they had officers at the park advising fans that the gig was cancelled and ensuring that they got home safely.